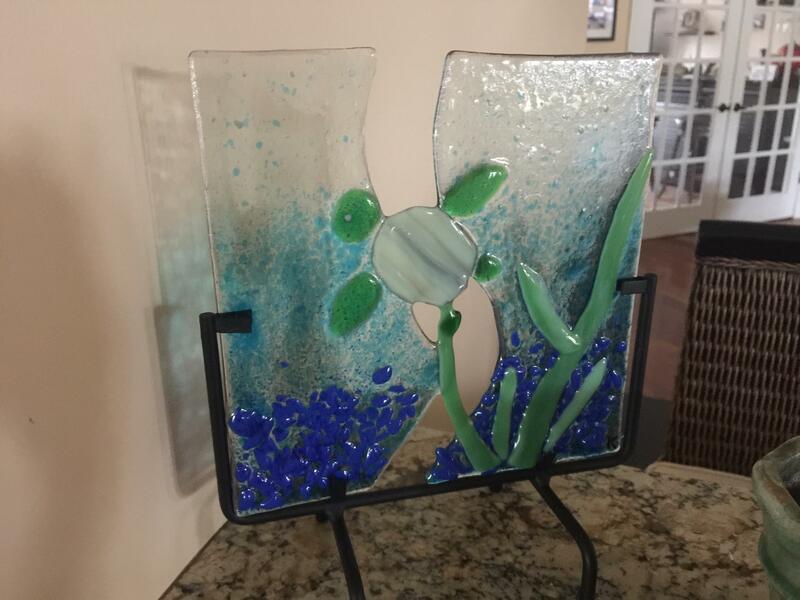 Become a Glass Impressions member and enjoy benefits that suit your creativity and time. We offer five options: hourly, 4-day pass, 1-month, 6-month and 12-month memberships. The Hourly Rate is $8 an hour and is for people who are just starting out, in town for a short time, or just need space and tools for quick projects. It includes use of work tables and hand tools. It does not include glass, supplies, use of power tools, storage of incomplete projects, or kiln time. The 4-day Pass is $60 and is usable during the hours when the Glass Impressions studio is open, (currently Wednesday through Saturday). This option allows people to work on projects at significant savings over the hourly rate. The 4-day Pass gives you unlimited time in the studio during the four days, use of both hand and power tools and a flat storage fee for 1 incomplete project. It does not include glass, supplies, or kiln time. Flat Storage Fee for 4-day period: $5; multiple projects can be stored at the same time for an additional fee. The Monthly Membership is ideal for the fused glass artist who needs space and tools and an extended time period to complete one or more projects. It may be a project for a birthday, anniversary, Christmas, or a special piece for that empty space in the your home. It allows flexibility to fit time into your schedule. Monthly members can come in anytime when the Glass Impressions studio is open, (currently Wednesday through Saturday). The $150 monthly membership fee provides a significant savings for people who want to create on a regular basis and is ideal for visitors who are here for an extended period of time. The Glass Impressions Monthly Membership gives you unlimited time in the studio during the month, use of both hand and power tools, free storage of up to two incomplete projects at a time within the month and kiln time for up to 5 firings. It does not include glass or supplies. A 6-month Membership is available for the amazing price of$500. It is for the avid fused glass artists who are in the area for at least half of the year, are continually creating fused glass art, and need unlimited studio time. These members can come in anytime when the Glass Impressions studio is open, (currently Wednesday though Saturday and by appointment on Tuesdays. This Glass Impressions Membership gives you unlimited time in the studio over a 6-month period, use of both hand and power tools, free storage of up to two incomplete projects at a time within the month and kiln time for up to 9 firings . Additional kiln time will be charged separately. Membership does not include glass or supplies. The Glass Impressions Annual Membership provides the most savings for the fused glass artist who does not have his or her own studio. This membership package is $800 for a 12-month period. Annual members can come in anytime when the Glass Impressions studio is open, (currently Wednesday through Saturday) and by appointment on Tuesdays. This Glass Impressions Membership gives you unlimited time in the studio, use of both hand and power tools, free storage of up to 3 incomplete projects at any given time and kiln time. This level of membership also provides a 15% discount on one class within a given month and a 10% discount on sheet glass.